It’s the Fourth of July, and that means fireworks. Before a show can be choreographed, the properties for each shell must be logged, including burn time, lift time and effects. Microchips embedded in the shells trigger the fireworks to explode at a specific height, in a particular direction and with millisecond precision. Curious about what technological changes have occurred since 2013, I did a bit of googling around. Two years ago, Jason Daley, writing for Smithsonian Magazine, pointed out the fundamentals haven’t changed much over the years. And he was talking about between 600 A.D. and now, let alone since 2013. Having said that, Jason does go on to list some of the changes he sees on the fireworks horizon. Some may ask what the point of fireworks that don’t make loud noises, but some locales are no longer allowing booming displays. Which has led to “quiet fireworks,” which just means designing shows with shells that don’t create as much noise pollution. He also mentions daytime fireworks. That means making colors brighter and even adding other display options like Flogos, corporate logos or designs made out of foam bubbles. One thing that fireworks companies haven’t been able to come up with is a deep and consistent blue. That’s because the copper compound required for blue tends to break down when the temperatures rise. But with better temperature control, the prospect of getting a “more stable blue” is on the horizon. 3-D choreography is another advancement that’s emerging, thanks to computer simulations and 3-D modeling. Sounds interesting – and something to look forward to. Bluetooth lets technicians set off a display, without their having to be anywhere near a fuse or gunpowder, which eliminates a lot of the lost-finger risk associated with fireworks. Like Jason in the Smithsonian article, Conor gives a shout out to simulation software which let technicians plan and test out complex, elaborate displays. Another safety element in fireworks is that the quality of the mortars themselves has improved, with high-density fiber replacing the dangerous cardboard tubes. Don’t light M80’s off in your hand. Don’t point Roman Candles at your friends. And most importantly, don’t do anything stupid. Not much to add to that, in terms of safety warnings. 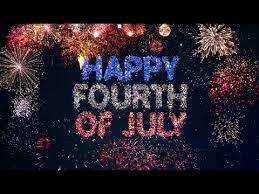 So I’ll end with wishing everyone a wonderfully glorious Fourth of July.